I created the reduced-gravity-sports tag because I see it as both technically/scientifically interesting, and likely to be really big in the future. Something that would be played differently due to the different acceleration experienced in space. ISS expedition 53/54 crewmembers played badminton. [Al] Shepard brought along a six iron golf club head which he could attach to the handle of a lunar excavation tool, and two golf balls, and took several one-handed swings (due to the limited flexibility of the EVA suit). He exuberantly exclaimed that the second ball went "miles and miles and miles" in the low lunar gravity, but later estimated the distance as 200 to 400 yards (180 to 370 m). [Edgar] Mitchell then threw a lunar scoop handle as if it were a javelin. 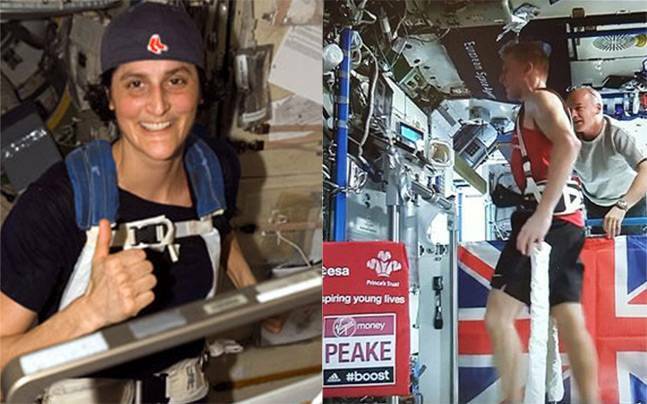 Sunita Williams ran the Boston Marathon in the ISS. Tim Peake ran the London Marathon in the ISS. Expedition 56 crew members including NASA astronauts Drew Feustel, Ricky Arnold, and Serena Auñón-Chancellor, and European Space Agency astronaut Alexander Gerst embark upon a tennis match in space aboard the International Space Station. There was a recent and heavily hyped "tennis match in space" as part of a staged event to hype the beginning of the US Open tennis tournament. To make it even weirder, it was projected on the Unisphere in Flushing Meadows, NY, which is incidentally Homer Simpsons's favorite place to go in the greater NY metropolitan area (GIF and Video thereof). See the US Open page Del Potro Talks Tennis Strategy With An Astronaut In Space where you can see NASA Astronaut A.J. (Drew) Feustel talk with Tennis player Juan M. del Potro. 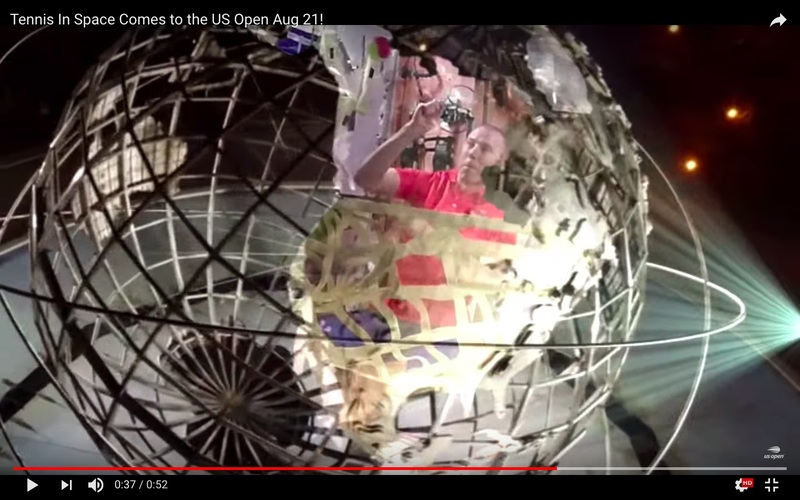 Here is another video showing Feustel in an earlier interview, and playing tennis in space! Starting at 24:24 he explains some of the physics of trying to play tennis in space in a very thoughtful and informative way. The discussion is too long for me to transcribe right now, I may make an attempt later if I have more time. As a thought experiment a few years ago I came up with a sport for low earth orbit and I'm trying to find where I wrote down the rules and can't. So I'll do my best to recall. The name of the game was spaceball. Which is ironic because the game doesn't use a ball. There are two teams in an arena that is approximately 18 feet in diameter and can be any length. One player from each team is essentially the "ball" and each team has to get their ball in the opposing team's hoop. The hoops are at both ends of the compartment in the center. Also, the compartment is rotating to give some force along the outside of the compartment. Not the answer you're looking for? Browse other questions tagged iss reduced-gravity-sports or ask your own question. What is the gravity inside a rotating cylinder? Are there any plans to reach the ISS by new means?